This is something special – first time on my blog I have a post done by someone else! Do you recall that Boris Jakimov made it to the hall of fame in the snap-through challenge? We talked a bit afterwards, and this is the result! I won’t edit Boris work*… but I will add some (hopefully!) witty and funny comments as quotes (like this one). One of the most common uses of material nonlinearity is considering plasticity phenomena. This post will cover one of the most simple cases we can encounter – simple tension of a standard tensile specimen. The specimen will be stretched and compressed above the elastic limit and two hardening rules will be considered – Isotropic and Kinematic. … and maybe a cup of tea/coffee. It will be 10-15 min of reading after all! 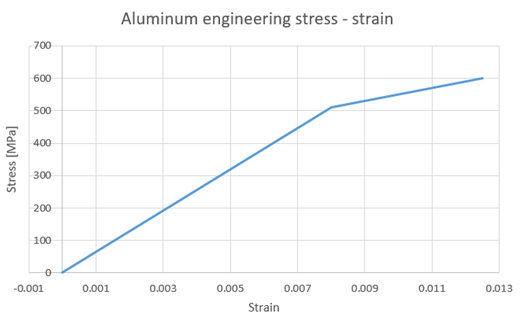 Standard Aluminum engineering stress-strain values are used to model the bilinear material model. 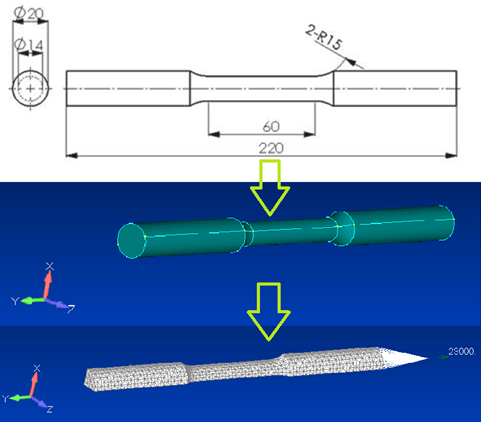 Bilinear material model is commonly used when no detailed data about the elastoplastic region behavior is available. It also proved to be a very good approximation of an Aluminum real-life material behavior. All we need are the Elastic Young’s Modulus, Yield point, and a Fracture stress point. Also, Poisson’s ratio is necessary for the complete definition of an isotropic material. I really like bilinear material model. Even through there are better ones, I still think this is great. Unless of course you need more – but I use more complex models only in very specyfic situations (like Customer request… which actually happened to me once!). 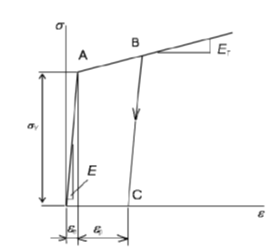 As mentioned, a standard tensile specimen geometry is used. Experiments show that a linear elastic model is only good for stress values bellow yield stress value. 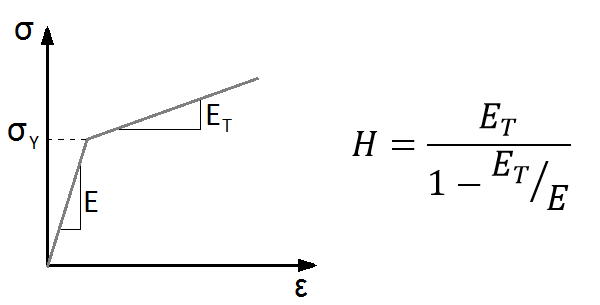 Up until that value, all the strains are elastic and the relationship between stress and strain can be expressed by Hooke’s law. 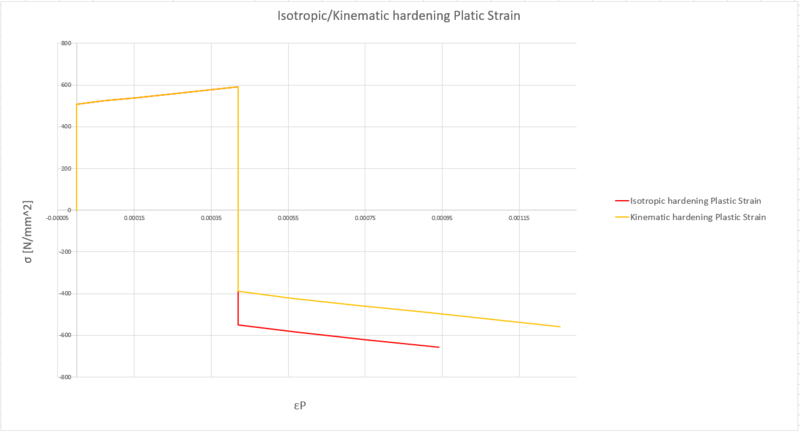 Once yield stress is reached, the elasto-plastic law covers the relationship between stress increment and now a combination of elastic and plastic strain. This post is dealing with a specimen modeled with an isotropic material, which means that the material behaves the same way in tension and compression, and in all directions. This is a very important piece of information since everything stated here for the one dimension case will be absolutely applicable for more complex cases. The basic premise when describing structure behavior out of linear elasticity region is that the total strain is divided into an elastic portion and a plastic portion! I know I get anxious when there are dx values on the drawings! 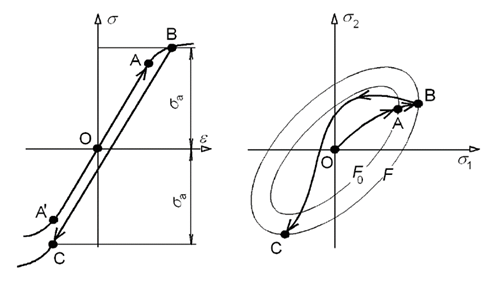 No worries, this is simple – linear deformation is purely elastic (index is “e”). But when you reach yield, most of the deformation from then on will be plastic (index “p”). Such deformation won’t “release” to the oryginal shape when you take the load away. … Ladies and Gentlemen! For the first time in history! 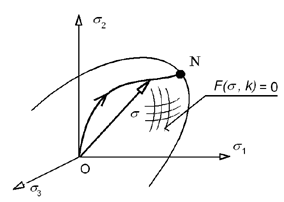 Enterfea blog hosts a *differential equation*! Boris actually used chart I did for this post… how cool is that! F = 0 for plastic deformations. where σ1/2/3 are principal stresses and σy is a yield strength of course. Each yield criterion is a function of the stress tensor and a material parameter (obtained by an experiment) and defines a surface described by principal stresses. Every stress state that can be plotted inside the yield surface is considered to be in the elastic region! Though it may not be clear at first glimpse, after yield stress is exceeded and the yield surface has expanded, we get a ‘bigger’ elastic region and a new yield stress! To prove what we just stated let’s finally fire up the FEA software and try to simulate what we have already theoretically specified. We will first load the specimen in tension above the initial yield stress denoted as σyo , that we will unload it, present the plastic permanent strains and load it in tension once more to prove the existence of the new yield stress denoted as σy1. Notice that first yield was at stress with index y0, while after unloading elastic region got “expanded” to the y1 “level”. This is why the “elastic zone expands”. This however would be the same both for isotropic and kinematic hardening… The difference comes later! Let’s test it even more! Now that we have seen what happens with new tension when the elastic limit has previously been exceeded, let’s see what happens if we now load the specimen in compression. Remember that we stated how the yield surface expands proportionally in all directions, and considering that with uniaxial compression we ‘move’ along the same x-axis representing the principal axis, we should reach an elastic limit at the same distance from the x-axis when compressing at the new yield point! If you load your model beyond yield and then unload you will “strenthten the model”. The next time you apply the same load, it will move completely in an elastic zone. 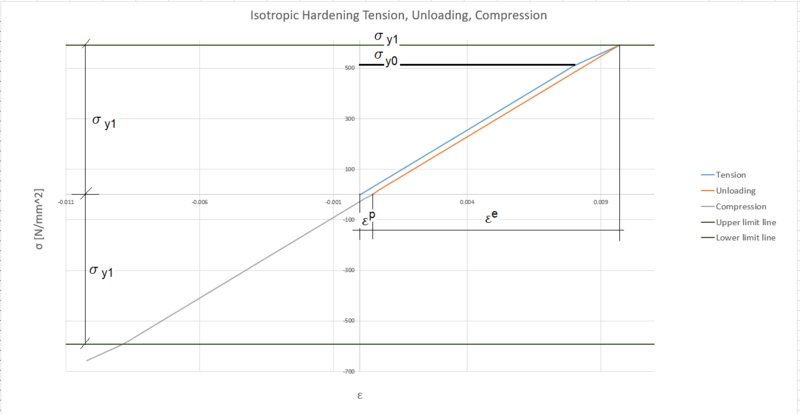 Isotropic hardening says this: if you apply tension, next time the elastic limit will be higher both for tension and for compression! Note now, we move along the principal axis (x-axis), so if we try and replicate the tension, unloading, and new loading experiment we would get the exact same result as with the isotropic hardening rule since the yield surface is translated in the x-direction just as much as the surface would expand in the previous case. Since the surface does not expand, but only translates, when unloaded and then loaded in compression the elastic limit should be reached earlier than in the previous case. 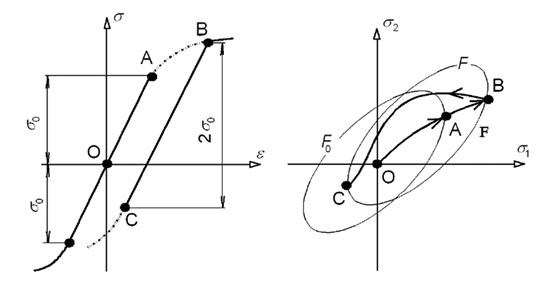 Also, although we have a new yield stress the distance between two elastic limits should stay 2 σ0. But… there is a price to pay (lighting blast behing the window)! If you strengthen the material by appliying tensile yileding… elastic zone for “compression” will be lower! It won’t even remain “where it always been”… it will actually have a lower value than before! 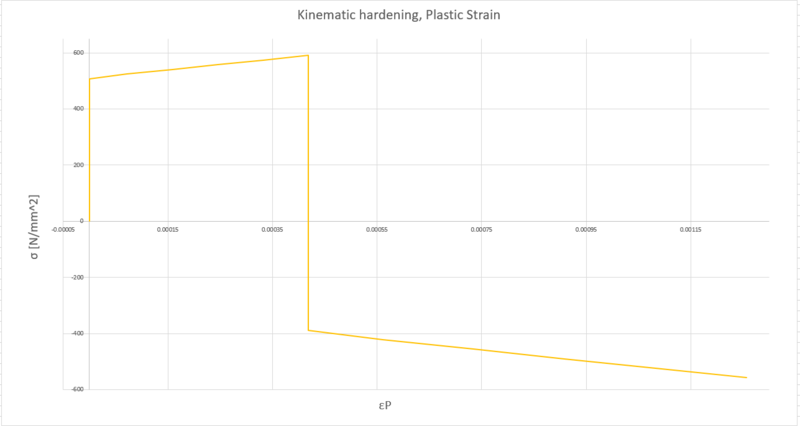 Maybe the best representation of the whole post can be seen on the following diagram, where we see that plastic strains in the case of Kinematic hardening rule when compression is initiated are reached earlier! This menas, that selecting isotropic or kinematic hardening is important only if you are expecting the load to change direction. If we would only load and unload a model in tension or compression (but not both) both hardening rules give the same outcomes. BUT… if you want to load your model till yielding and beyond, and then change the load direction this is important! 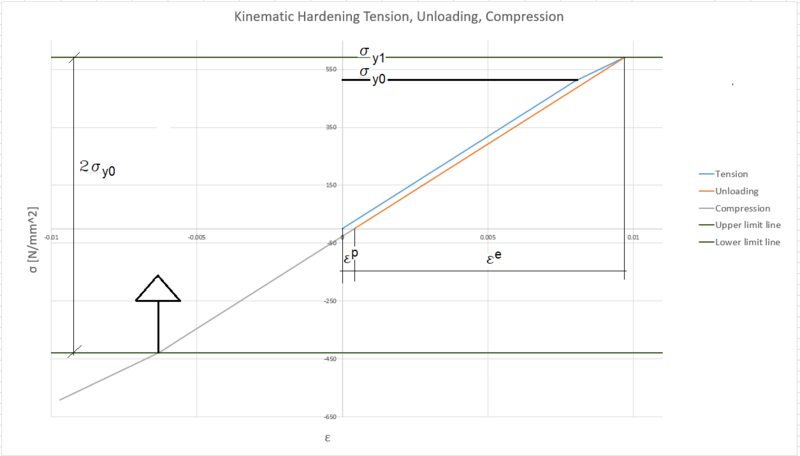 Kinematic hardening will increase yield in one load direction, but will reduce it in the other load direction (regardless if you apply tension or compression first – it will act the same way for both!). I think Boris will be very happy if you would write few words of encouragement below in the comments. Also, if you like the idea of guest posts – let me know! Perhaps you would like to write a post on the blog? If so, just drop me an email at: enterfea@enterfea.com! A big thank you to Lukasz for providing me with this great opportunity and privilege, and to anyone reading this post! Any feedback would be greatly appreciated. Also if you have any questions regarding the post, I would be more than happy to get around to them. It’s a pleasure to work with you Boris! BTW where are you now? Australia/Japan/Poland? Thanks, Boris, for such a simple and nice explanation of the complex topic. 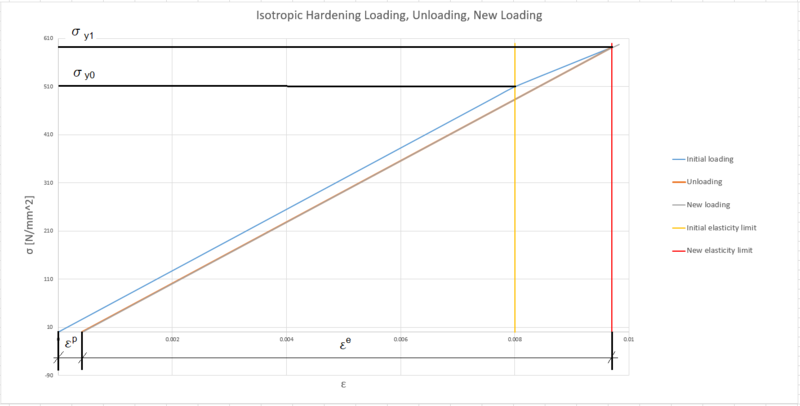 Now here’s a query: I had read somewhere that isotropic hardening model is good for large strain applications whereas kinematic hardening is good for cyclic loads. I believe for non-cyclic loads both models should give the same results, hence I don’t understand recommendation for large strain applications. As you can see in the post, for non-cyclic loads both rules give the same answer… as they are used to determine what will happen in the cyclic loading conditions. I don’t know where the recommendation may come from. 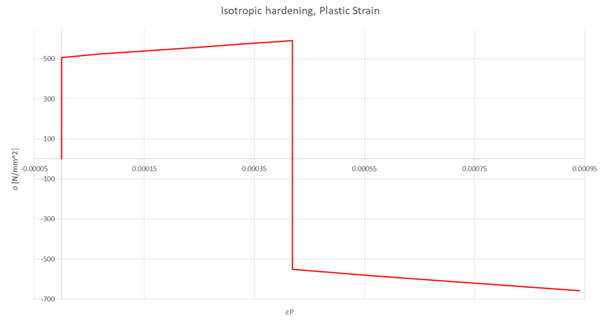 Maybe someone thought that since it doesn’t matter it can be isotropic hardening just as well? Yes, as far as I understand this kinematic hardening is a conservative choice. Thanks for sharing us such great post. I just wonder when should we use isotropic hardening or kinematic hardening while the specimen is subjected to cyclic loads. I won’t even pretend I’m a super-expert on low cycle fatigue and crack propagation. I know my part, but there are limits to this (and big ones I guess!). Definitely, this will depend on the material you are using in an analysis. All in all, as far as I know, there is no “perfect rule”, but in order to solve a specific case (or to find a specific answer), it would be best to read some scientific literature on the subject. So far this was not in my zone of interest, so I won’t be able to be more specific than that! Many thanks to Boris and Lukasz.for this usefull article. I like very much how this subject is written. It helped me in understanding the differences between these two hardening rules. The presentation must go on! Great Article, thank you to both of you. I had read too many articles to understood this hardening concept earlier, but i couldn’t get clear Idea and this one is excellent and explained in very systemic manner. “Neither rule is actually correct as far as I know – the truth lies somewhere “in-between”. ” – it’s wrong. It is popular mistake last yeras. … what interests me though is why “mixed hardening models” where introduced. If isotropic is wrong, and kinematic is right… who would waste time to mix both of those? Are there any new research that could shed some light on that that you are aware of?